Kitchen Bouquet has trace amounts of gluten in it. Maggi seasoning has gluten in it. And those little instant gravy packets have gluten in them, plus they are disgusting. What is a gluten-free Thanksgiving eater to do? Make gravy from scratch. Please. It’s so easy. Melt the butter in a pan on low to medium-low heat. When it has completely melted, sprinkle in the rice flour in small handfuls. Stir and stir. 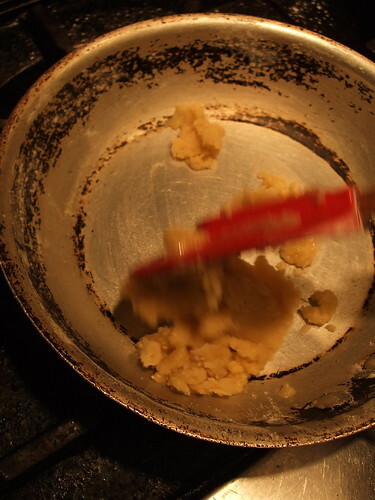 When you have added all the flour and the mixture has become coherent (see picture above), let it cook in the pan for two to three minutes, stirring all the while. When it has cooked, it will be solidified and have a tinge of brown. Take the roux off the heat and let it rest for a moment. Put the roux back on low to medium heat. Slowly, in small amounts, add the chicken stock (or turkey juices), whisking the mixture vigorously until all the liquid has been absorbed in the roux. Continue to do this, in small drizzles, until the roux has expanded and liquified into gravy. This will take awhile, perhaps ten minutes or so. Be patient. When you have reached the consistency you desire for the gravy, add salt and pepper. Taste the gravy, and season according to your taste. Take it off the burner and serve it, immediately. We spent yesterday afternoon wandering through the market on Portabello Road and were amazed at to see so many gluten free wares. You must be catching on. Is cornstarch allowed on a gluten free diet? My grandmother and mom make the T-day gravey from turkey broth and cornstarch as the thickener (I never knew about packets of gravy mix until I went to college. I thought everyone knew about cornstarch as a thickener). Just curious. Thank you for this blog. I enjoy dropping by everyday. I use corn starch as a thickner, also. I find restaurants around here do not use any thickner but flour. Be careful with cornstarch, it should be gluten free but some are processed on mills which wheat has been. always confirm with the manufacturer regarding trace amounts or possible modes of contamination due to their processing methods. ): same thing with corn meal, my mum and I learned that one the hard way. Took us a while to figure out what was going on. My grandmother was amazed at how easy it was to make gravy using corn starch in place of the flour a couple years ago. We are also dairy-free in addition to Celiac, but a gf/df margarine subs fine for butter. What I had to remind my grandmother was that if the turkey was stuffed with gluten or if it was pre-basted with “broth” or somesuch, the juices aren’t gluten free. You’re right that it’s not at all hard to make an excellent gluten-free gravy. When I make a roux based sauce or stew for my coeliac father I tend to use a blend of 5 parts soy flour to 3 parts brown rice flour and 1 part cornflour. I find that rice and soy flour alone doesn’t thicken well enough, which is why I use a small amount of cornflour. The only problem is that the soy flour can make it over-sweet for some people’s taste. Growing up in a family that made everything for Thanksgiving from scratch, I figured that was the way everyone did it. I never understood what those gravy packets were for, when making gravy is so very easy. How would you describe the difference in flavor from using rice flour rather than wheat flour for the roux? Strange as it sounds, in spite of growing up in the States, I never celebrated Thanksgiving. My parents are Canadian (and so am I, by association). So, when my brother and I had American Thanksgiving off from school, my family went on holiday to visit the grandparents in Canada. And there was no celebration of Canadian Thanksgiving (which happens on a Monday in October) because neither parent grew up with it. And, so, it spite of all that, I adore Thanksgiving food and so I am incredibly grateful to be reading all of your lovely, gluten-free recipes for the holiday (which may or may not have anything to do with the fact that it will allow me to take back one of my favourite snacks: fries with gravy [Canadian indeed]). With that, two quick questions re: your version of GF gravy. First, can I substitute an olive oil-based margarine for the butter (to minimise dairy content)? Second, would I be losing out on taste by using arrowroot flour (which is already in my cupboard) in lieu of sweet rice flour (which is not)? I have been reading for a while…almost a year? And you have inspired me to start baking! I have made variations on some of your cookies, that have turned out well. I could say many things, but I’ll be brief now. I am driving to Seattle for a concert this week, and if you could suggest one bakery type place to go during my 24 hour trip, I’d appreciate it…I am sure I will return again soon. I should say that I don’t eat corn or peanuts either, but I will not die if there are peanuts used at a bakery. I use cornstarch, too. And just a couple of Tb’s of heavy cream at the very end. Another trick I’ve done is to chop up VERY small: 2 celery stalks, 1 small onion, a 1″ piece of carrot (have to be careful because carrots adds too much orangey color). I boil the heck out of these in GF chicken broth until completely gooey tender. Then run through my food processor to puree. I do strain this through a sieve, and then back into the pan, add the turkey (or chicken or beef) drippings — and thicken as necessary with cornstarch, or a combination of cornstarch and arrowroot. A little extra trouble, but pretty yummy! Makes a very rich gravy. Sounds great. Where do you get the sweet rice flour? Is it different from brown rice flour? Try any Asian market. Happy hunting. This is the best gravy…and yes, so easy! I just used Bob’s Red Mill all purpose gluten free flour, because that’s what I had, and it is delicious! Am about to make this gravy with juices straight from the bird! Great site – just bought the book off of Amazon too. Why are there so many celiac-ignorant doctors in this world??? My life started at 26. I have used potato flour as a thickener in roux for sauces and gravies to good effect. The mild potato flavor is perfect for turkey gravy. You might have to use a little more to achieve the desired consistency. I always add a little wheat-free tamari at the end – that’s my secret ingredient! jimbob said to be careful of premade stocks containing gluten. Two good gluten-free ones are Pacific brand and Swanson’s Organic. I’m in charge of the gravy this year and will be using the gravy recipe from Cook’s Illustrated which sounds very similar to suzanne’s vegetable-based one. Not sure if I’ll try thickening it with cornstarch, potato flour or Shauna’s roux. Hmmm. O MY GOODNESS! being on a gluten free diet since i was born ive been desperalty searching for gluten free recipes for the holidays. Im only 14 and staying on my diet is frusrtaing to see others eat pie, gravy, etc. i cook constantly and never leave the kitchen when the holidays come around. unforntunatly every time i work hard to cook a wonderful looking thanksgiving dinner for my self, my family is not celiac only i am, the unexpected happens and i am disappointed by the taste. for once i have a fantasic webiste that not only has great recipes but insuring recipes. i now look forward to tecnically having my first thanksgiving this year thank you so MUCH Gluten Free Girl!!! I have a question about the gravy. I am still in the phase of celiac disease such that I am lactose intolerant (though I hope that will change) and butter is not my friend. Can you recommend a non-margarine fat as an alternative to the butter? Fleishmann’s has a non dairy butter that is wonderful and smart balance makes ones with flax seed. how much gravy does this make? enough for 15 ppl?? Fleischmann's Unsalted Margarine in sticks is currently gluten and dairy-free. Read the ingredients, always, to determine whether or not the product has been changed. Also, what is the proportion of cornstarch to fat and broth in the cornstarch-based gravy? Thanks! How could you make this gravy without rice flour. I can't have gluten and I am allergic to rice? Any suggestions would be amazing since I am struggling with the rice limitation. Hello! I was wondering if I could switch out cornstarch for the sweet rice flour, I've got one on hand, and not the other. What do you think? Reduce home-made chicken broth to max, add de-fatted pan juices and continue reduction to make essence of bird gravy. Can be expensive. Especially tasty starting with free-range roosters and old hens from the chicken coop. Thanks for the gluten-free gravy suggestions, everyone. I have a variety of Bob's Red Mill gluten-free flours, plus corn starch, of course. I will have to decide tomorrow which to use. For the lactose-intolerant, you do not have to give up butter! There is ghee. You can buy it, but it's a whole lot cheaper to make it yourself. I turn all of my butter into ghee. You use it exactly the same as you would butter and the extra buttery taste is delicious. You boil the butter well past the "clarified butter" stage, until all of the lactose-y parts have either dropped to the bottom of the pan or evaporated off the top, leaving nothing but the clear butter fat. The way I tell when it's ready is the solids adhering to the pan are just beginning to brown. Remove from heat and let sit for at least five minutes. You might have a little bit to skim off the top and discard. Pour through a very fine strainer into the container of your choice. If using a glass jar, make sure the ghee is cool enough first. Ghee does not need to be refrigerated. just a mother of a child who has Celiac, I would like to see manfacturers not putting junk in our food. It's like Dr. O says: If you can't pronounce it,it's not food. We have to get mad and start demanding that they change things. I'm done with being stressed out every time I go to the grocery store. I used to love to shop….not so much anymore. I've had problems with this recipe as well. It only came together as pictured after I started to add broth. But the gravy came out nice and thick in the end. I made a variation of this gravy for my family for Canadian Thanksgiving. It turned out very well. My sister is a vegitarian and we cannot have gluten or dairy so… I used a dairy-free margarine instead of the butter, and a vegitable stock instead of chicken broth. Also, prior to making the roux, I very finely chopped some leeks (instead of onion) and sauteed them in olive oil; added some garlic and sauteed a little more. Then I followed the recipe with the leeks and garlic already in the pan. The rest is history – happily in all of our bellies! Also, when I was in Wisconsin last summer I found a store – Silly Yak – it was wonderful – has everything for people with celiac sprue – they have a website and you can order online. I am new at gluten free food prep. Can I make my traditional gravy using drippings from the Turkey and subtitute flour with potato starch? I am so happy to find your website!! We are having a thanksgiving potluck at our office tomorrow and one of our team members has celiac disease. I am making a gluten free turkey, stuffing, and gravy for tomorrow! Keep up the great work!! Will repost on how the gravy comes out!! Earth Balance is the best tasting and works well for so many things. For this type of holiday gravy, I just use cornstarch and water to thicken it so I get that “glossy” look to it, but this is great to know for white, standardly roux based gravies. Once I make a decent batch of gluten-free biscuits, I’m soooo making some biscuits and gravy. Yay! If you use the pan drippings from the turkey (or chicken), don’t just pour it off. Make sure you scrape up all the little brown bits sticking to the pan – they will give extra flavor AND color to your gravy. What am I doing wrong? You say it takes 2 or 3 minutes of cooking and stirring for the butter and rice flour to clump? I have made this twice now. The first time using margarine instead of butter and it finally clumped after 20 minutes or more of stirring. It took about another 20 minutes of stirring for the stock to be absorbed. This time I used butter and after 30 minutes plus of stirring it isn’t clumping. Ken, the margarine acts very differently than the butter. And it doesn’t form a roux ball, the same way it would with gluten flour. Instead, you want a thick paste, like a slurry. And then you pour that into your hot stock.